The FIEurope Innovation Award highlights that Citri-Fi® 100, a natural citrus fiber with intact pectin, can replace or extend added pectin in fruit-based food products.This innovative solution can provide food manufacturing companies cost savings and stable supply, globally. 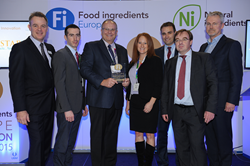 Fiberstar, Inc., a market leader in citrus fiber technologies, once again demonstrates their innovation by winning the 2015 Food Ingredients Europe (FIE) Natural/Organic Award. This globally recognized award highlights those companies that are committed to creating new and novel uses for food ingredients to better the food industry. This award emphasizes Fiberstar’s leadership in providing the global marketplace a natural solution to replace added pectin within bakery and confectionery fillings, spreads and fruit preparations for yogurts. Citri-Fi is produced using a clean and patented process that keeps the insoluble and soluble fibers intact. The native pectin within the composition is activated when using high sugar/low pH food processing conditions to produce the natural gelling properties. Since Citri-Fi is offered in various particle sizes, formulators can target specific gelling textures ranging from pulpy to smooth. Citri-Fi 100 does not require a pre-hydration step or added calcium to create the gelling textures. As a result, product developers may benefit from additional cost savings when replacing pectin. In addition to the cost savings, the Citri-Fi gelling technology is non-GMO, gluten-free, Kosher and Halal certified. Citri-Fi 100 is labeled as citrus fiber or dried citrus pulp and it contributes fiber to the nutrition label. This citrus fiber can also replace expensive stabilizers or stabilizer systems due to its unique water holding properties. These application benefits and formulating guidelines are available on the new web site that Fiberstar recently launched – http://www.fiberstar.net. About Fiberstar, Inc.: Fiberstar, Inc. (http://www.fiberstar.net) is a privately held innovative biotechnology Company focused on enhancing food performance by manufacturing and marketing value-added food ingredients. Its largest brand, Citri-Fi is an all-natural highly functional fiber produced sustainably from orange pulp or peel using a patented process. Citri-Fi is GRAS, non-allergenic, neutral in taste & odor and non-GMO. This functional fiber line benefits meat, dairy, bakery, gluten-free, sauce, condiments, frozen food, beverage and health & wellness food products through textural improvements, nutritional enhancements and/or cost savings. Headquartered in River Falls, Wisconsin with manufacturing in Florida and Wisconsin, Fiberstar sells products globally in over 65 countries.